Illustrations: 5 tables, 5 b/w illus. 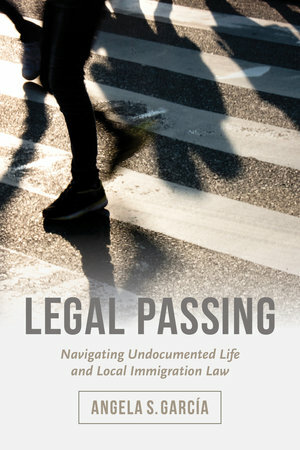 Legal Passing offers a nuanced look at how the lives of undocumented Mexicans in the US are constantly shaped by federal, state, and local immigration laws. Angela S. García compares restrictive and accommodating immigration measures in various cities and states to show that place-based inclusion and exclusion unfold in seemingly contradictory ways. Instead of fleeing restrictive localities, undocumented Mexicans react by presenting themselves as “legal,” masking the stigma of illegality to avoid local police and federal immigration enforcement. Restrictive laws coerce assimilation, because as legal passing becomes habitual and embodied, immigrants distance themselves from their ethnic and cultural identities. In accommodating destinations, undocumented Mexicans experience a localized sense of stability and membership that is simultaneously undercut by the threat of federal immigration enforcement and complex street-level tensions with local police. Combining social theory on immigration and race as well as place and law, Legal Passing uncovers the everyday failures and long-term human consequences of contemporary immigration laws in the US. Angela S. García is a sociologist and Assistant Professor in the School of Social Service Administration at the University of Chicago.